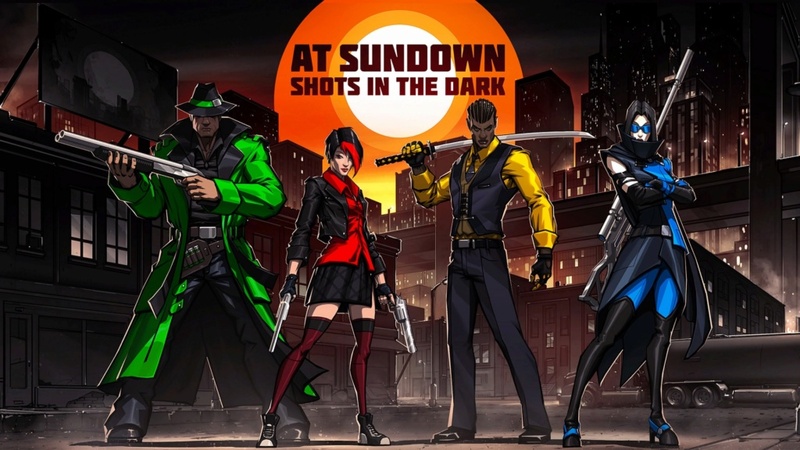 At Sundown: Shots in the Dark is a quirky, new, omniscient, third-person shooter developed by Mild Beast Games and published by Versus Evil that has potential. Training Mode: The only single-player mode that is the unofficial tutorial of the game. This mode has trials for movement and each weapon in the game. The training mode starts with the movement trials which teach the player the movement mechanics. The game then goes on to do the same thing with the weapons trials. These trials teach the player what happens when that fire mode is used with each weapon. As the player levels up, they will unlock new weapons which will unlock more trials. There is also the option to earn medals by completing the individual trials under the bronze, silver, and gold times. Local Mode: In this game mode players can play matches with a maximum of four other people or play players against bots. In this mode, any unlocked match types and maps can be used. The player(s) can also use unlocked special limitations that can make the games even more exciting. Online Mode: Here the player can play against other players online. In this mode, all playable modes in local can be played with others online with the addition of 1 v 1 and 2 v 2 ranked modes. Online mode has the potential to be enjoyable, but with 10-30-minute queue times, it makes it hard to be able to sit down and play. The problem with the queue times is likely that there are not enough players trying to play at the same time. Unless the player has a full group of 4, it is unlikely that a full session will be found. This game would certainly benefit from more players, but it lacks them so severely it is likely driving away current players in the process. At Sundown has a level progression system that allows the player to unlock more content by gaining experience. Experience can be gained by playing all of the available game modes (in training it only counts for the first completion, and the achievement of the medals also limited to their first completion). The player gets to unlock new weapons, game types, maps, and special limitations to make matches more exciting. This game’s niche is that the player cannot see where the other players are unless they are in the light or exposing themselves. This niche is a fun concept, but it seems like it is difficult to implement fairly. While there are obvious ways for players to expose themselves such as running and shooting, the player also reveals themselves by pinging their location. In the training mode, this mechanic is introduced to provide players a way to find themselves in the darkness, but it does not explain that it also reveals themselves to other players online. Due to this, the player’s ability to keep up with their location is challenging to do without giving it away which takes away some of the fun of the game. Visuals: While the game is based around darkness, Mild did not use that as an excuse to take a shortcut on the visuals. 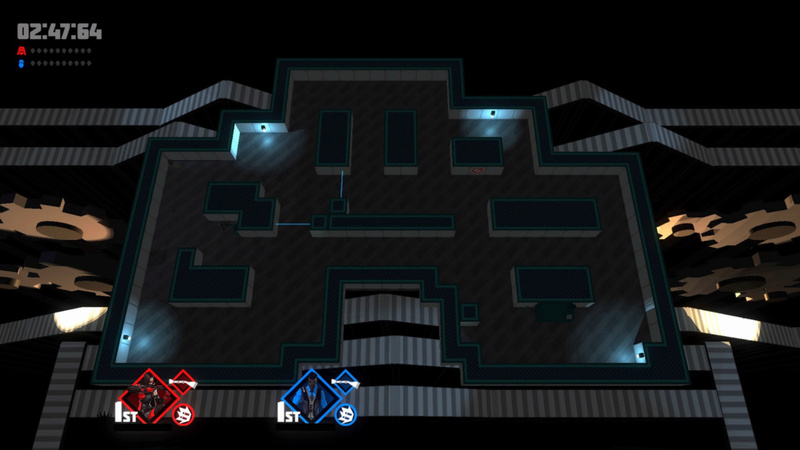 The 15 maps are enjoyable and detailed, and the special effects for running and attacking are remarkable. 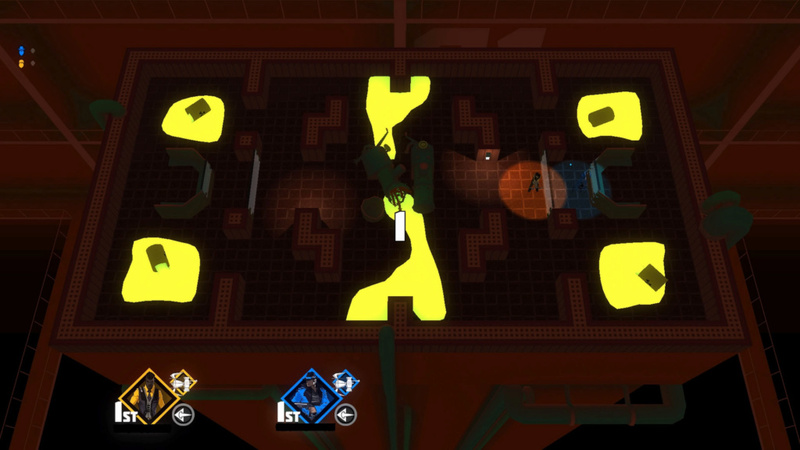 The color contrasts they bring into the game is very visually pleasing as they chose to use bright neon colors to pop against the dark maps. Audio: The music in this game helps set the theme. It is a mellow jazzy sound with moments of urgency that almost seems to be out of a spy cartoon. The sounds for the weapons are good, and the voice lines that occur when a player dies, or an objective is completed are highly amusing. Controls: The controls take time to learn. In training mode which teaches the player the controls, it only prompts which controls to use when. It does not have explanations for what is going on, so it is mostly learning through guided experimentation. Completion: To complete this game it would probably take 15-20 hours to finish the in-game level-up system, but probably closer to 30 or more to achieve all the trophies. This game has some flaws but also has potential. It would make for an excellent party game, and the best thing that could happen for its online mode is more players. @SalsumHawkeye Wow your reviews are absolutely amazing! I can't believe how good you are at this! I look forward to your next review, which you should be getting another game to review fairly soon. Thanks @Towafan7! I’m looking forward to it! Nice review lol. JNES5 would be proud. This sounds a bit boring, great review though! Party games are always fun...or they would be, if I had any friends that actually live locally.